To Sum It Up: Just when Nick Gautier thinks he can take a breather from his recent encounters with zombies, he finds himself entangled with the supernatural all over again. He’s trying to learn how to control the powers he never knew he had until recently, and one of his teachers is none other than Death himself. Nick also has a new foe in his school’s football coach, who’s threatening to have Nick put in jail if Nick refuses to assist him with his top-secret, and undoubtedly evil, scheme. Once again, Nick must save the day, all while trying to avoid being grounded by his mom. Review: It’s been a while since I had the opportunity to read two books from the same series back-to-back, as I did with Infinity and Invincible, the first two books in Sherrilyn Kenyon’s Chronicles of Nick series. Since Invincible picks up immediately after the events in Infinity, the timing worked out particularly well. Although Infinity was a fun read, I ended up liking Invincible even more. I haven’t read any of Kenyon’s adult Dark-Hunter books (something that I plan to remedy ASAP!). Infinity was my introduction to the world of the Dark-Hunters, and I spent a good deal of the book trying to keep track of the characters. Now that I had a better grasp of who was who, I was able to dive right into Invincible’s story. Nick’s acerbic commentary is what made Infinity so much fun to read for me, and he doesn’t disappoint here. He appears to have met his match in the sarcasm department, though, in the form of Death. Death, or Grim as he likes to be called, has the not-so-easy task of teaching Nick how to use his powers. With Grim being Death and all, he’s not very tolerant of being upstaged by the Gautier wit and bluntly tells Nick so. The verbal exchanges between these two are laugh-out-loud funny; Kenyon certainly knows how to write humor. I was happy that Kyrian, the Dark-Hunter who saved Nick’s life in Infinity, had a slightly larger role in this book. I was equally glad to see the towering immortal Acheron and Simi, the demon who’ll eat anything with barbecue sauce on it, again, too, although their appearances were much too brief, especially Simi’s. My favorite zombie hunters, Bubba and Mark, are also back. Those two seriously need their own spin-off! We get a bit of Bubba’s backstory here, and it is really heartbreaking. I respect that man even more than I did before. I thought that the story line, which involved the new football coach at Nick’s school blackmailing Nick into stealing seemingly random objects for him, was meatier this time around. On the whole, Invincible seemed less expository than its predecessor. 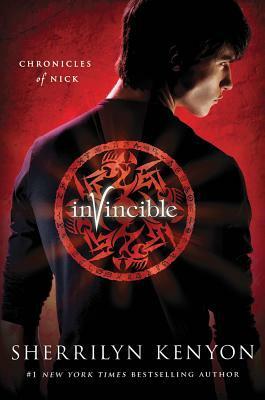 Before even finishing this book, I knew that I was going to continue with the series, but once I reached the jaw-dropping cliffhanger, I wished that I had a copy of Infamous to begin reading the moment I was done with Invincible. All in All: If you became a fan of Nick’s after the first book in the series, like I did, you won’t be disappointed with Invincible. I’ve really taken a liking to the characters in these books, and I cannot wait to read more about them in Infamous! Yay!, so glad you liked this book. I love the first book, and now I know I need to get the sequel ASAP. Great review, you got me all excited to read this book. It was a lot of fun to read. I hope that you have the chance to read it soon, too. I finally got Infamous from the library last week and can't wait to find out what happens next. Great review - the characters sound wonderful. I'll see if I can get Infinity from my library; Sherrilyn Kenyon's been recommended to me a couple of times, and I think it's time I tried one of her books. For me, the characters are what make this series so enjoyable; I really love Nick's narrative voice. I hope that your library has these books!